As we get older, our skin seems to slow down. But what if we could help our skin continue to function at its best? We can, with Weleda Pomegranate Firming Serum. Containing a blend of highly effective natural ingredients, Weleda Pomegranate Firming Serum is the ideal companion to your skin’s natural aging process. Containing organic golden millet, rich in vitamin E, and precious organic pomegranate juice, rich in antioxidants, this intensive treatment actively aids your skin’s own ability to regenerate. 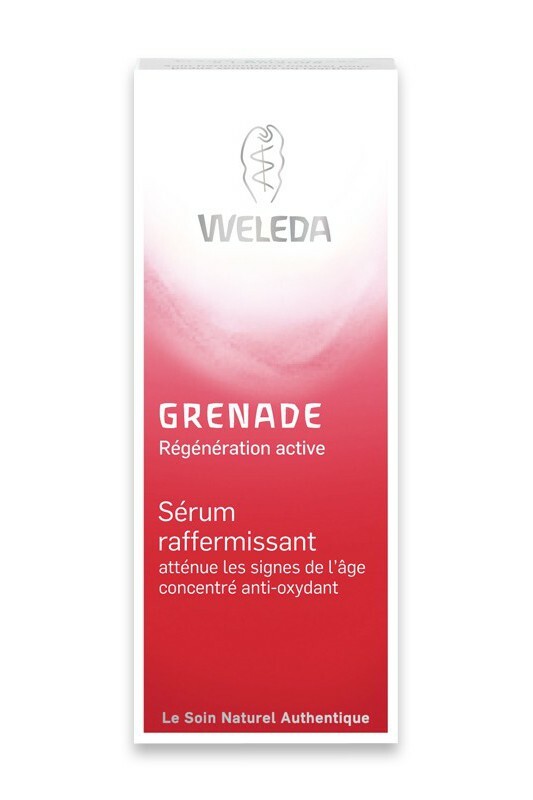 Weleda Pomegranate Firming Serum helps reduce signs of aging while deeply moisturizing. Dermatological tests shown that wrinkles are reduced by 29%* after 28 days and skin moisture levels increased by 39% after 30mn** when using Weleda Pomegranate Firming Serum. *Measurement of depth of wrinkles with PRIMOS, test with 20 subjects between 41 – 65 years of age, application of the product twice daily for 28 days. **Measurement of skin moisture with a corneometer, test with 23 subjects between 41 – 70 years of age, 30 minutes after application. 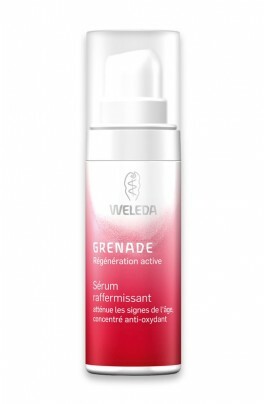 For best overall results with Weleda Pomegranate Firming Facial Care collection, apply the Pomegranate Firming Serum to your cleansed face, neck and décolleté morning and evening before applying Pomegranate Firming Day Cream or Pomegranate Firming Night Cream. Water (Aqua), Alcohol, Glycerin, Aloe Barbadensis Leaf Juice, Punica Granatum (Pomegranate) Fruit Juice, Panicum Miliaceum (Millet) Seed Extract, Prunus Spinosa (Blackthorn) Wood Extract, Xanthan Gum, Citric Acid, Fragrance (Parfum)*, Limonene*, Linalool*, Geraniol*, Citral*, Coumarin*.